This honestly looks like the best bad Chinese menu I have seen in a while. I am completely hung up in deciding between Pure speculation Meat and Pure belly Clearance. 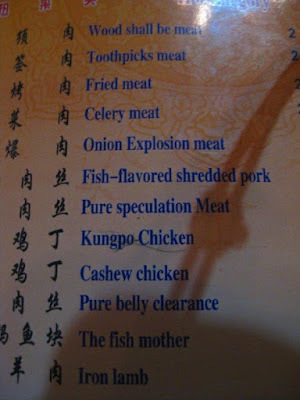 I don't recommend "pure speculation meat"--I got plenty of THAT in my college cafeteria! I'm assuming the "celery meat" is for the vegetarians(ahem! ), and I'd suppose the "fish mother" is what's leftover after they extract the caviar. I wanna try the "wood meat", though I fear it's just overcooked.....L.B.